As I mentioned, since we’ve covered some of the background of The Fall of the Roman Empire in past posts, I thought it would be nice to celebrate its’ anniversary with videos and screenshots. Especially if you don’t have time to devote to a movie with a running time of 3 hours and 8 minutes. I also promise, I’ll try not to mention Gladiator any more than I have to. *insert HUGE smiley face here* Pop some popcorn, get your drink of choice and enjoy. Let’s begin with the little over 4 minute trailer. You have to admit: it’s epic, it’s monumental, it’s everything you think of when you think ‘movie about the Roman Empire’. Did you know you’d undergo so many emotions?! Not 1 or 2 but 9 glorious performances?! A re-creation of such much action and drama?! Hey, that’s what the trailer tells us. So let’s find out! Woo! Okay, the trailer’s out of the way, so let’s get to the heart of it. Pretty pictures! And movie posters – posters that have you thinking ‘I must see this spectacle!’ I…think. Stephen Boyd as Livius in the 1964 ‘The Fall of the Roman Empire’ – the hero who is the enemy of Commodus, is in love with Lucilla, and a loyal subject to Marcus Aurelius and named his successor. Don’t DARE tell me that sounds familiar! Lucilla and Livius (Sophia Loren and Stephen Boyd). Boyd got the role originally offered to Kirk Douglas and Charlton Heston. Almost afraid to ask what he’s thinking! Better known as Captain von Trapp in ‘The Sound of Music’, Christopher Plummer was cast as Commodus when Richard Harris had a prior commitment and couldn’t take on the role. Following Commodus’ grand entry into Rome, the slave behind him repeats what is told of all Roman victors as they enter the city: ‘”Respice post te. Hominem te memento”‘ – “Look after you and remember you’re a man.” In the movie, the slave says something to the effect of ‘Remember you are mortal.’ Oh I’m sure Commodus will take THAT advice to heart! One cover (I think the trailer might too) proclaims this scene as the greatest chariot dual in movies. Of course I started screaming “What the hell? What about Ben-Hur?” Then I reread it – DUAL. Gotcha! Because ‘Ben-Hur’ had a race between about 8 or 10 charioteers, and they all drove FOUR horses. 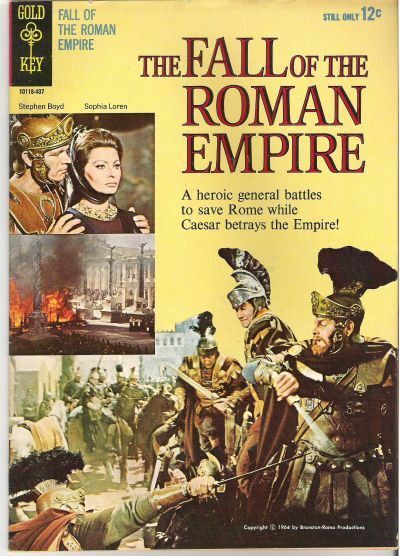 Although…Stephen Boyd is in both movies! Notice the description on the book cover! A father-daughter moment: Alec Guinness’ Marcus Aurelius and Sophia Loren’s Lucilla. And the Emperor announces who his successor will be – and it’s not Commodus! Sophia Loren’s Lucilla and Stephen Boyd’s Livius have their moments. And as a lover of film costumes, seeing Loren in the scene made me think of Connie Nielsen in Gladiator as you see above. Of course, she also shares a quiet moment with Maximus before everything sadly hits the fan. Commodus’ parade into Rome. This is friggin’ amazing, especially when you consider this is not CGI!